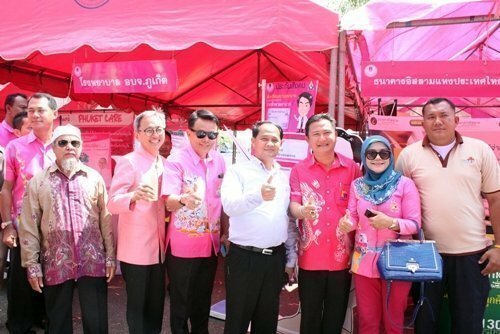 The Or Bor Jor Sanjorn fair (Mobile Service Clinic) was launched at the Khum Nam Bang Maruan public park in Sri Suntorn subdistrict on the morning of Saturday, February 21. The opening event was hosted by Governor Nisit Jansomwong with President Paiboon Upattising delivering an opening speech. The launch was witnessed by PPAO officials, Sri Suntorn Mayor Worawut Songyot, invited guests and members of the public. PPAO officials present were: Vice President Soratham Jinda, President Advisor Boonserm Suwannarathphoom, Chief Administrator Watcharin Pathomwattanapong, Council Chairman Theera Jiasakul, Council members and other officials. 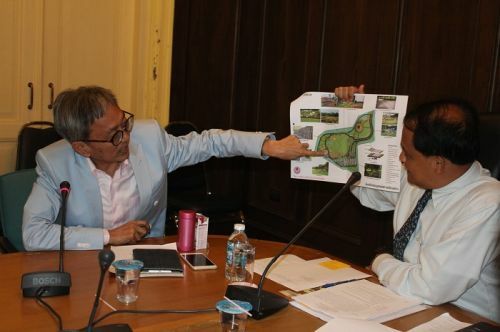 According to Mr Paiboon, Or Bor Jor Sanjorn is an ongoing project organized by PPAO various Phuket communities. For this even, which the second of the fiscal year 2015, PPAO works in collaboration with Sri Suntorn Municipality. The objectives are to promote people’s participation and for PPAO officials to meet the community on the grassroots level in order to tailor future public work projects that will directly answer the people’s needs. The event also aims to entertain and establish unity among members of communities following the instructions by the National Reform Council. Other government and private agencies have given support to the event. This includes the navy band from Third Naval Area Command, entertainment and stage shows by student groups and local clubs. Altogether, 50 service stations have been set up by government and private sectors to give a variety of free services to the community. Central to the event is the “people forum” which provides opportunities for members of the public to suggest new ideas and plans for future public works. Governor Nisit reiterated all points listed by President Paiboon, above, and ended his speech by thanking PPAO. He hoped the organization would continue to hold more beneficial activities such as this one in the future. President Paiboon on February 18 took part at the second Thalang Memorial committee meeting chaired by Governor Nisit Jansomwong, at the Phuket Provincial Hall. Involved officials attended the meeting as well as Mrs Wasana Sriwilai, Director of Engineering Division of PPAO. Thalang memorial was constructed with the aim to honor the two local heroines – Lady Thep Kasattri and Lady Sri Suntorn. Most of the construction has been completed. The meeting discussed works still have to be done and other businesses as discussed in the committee meeting on October 24, 2014. The meeting agreed to draw up a proposal for a further funding under the fiscal year 2015. Other businesses included: repair works for the area surrounding the memorial, responsible bodies to work on the landscaping around the Nine Heroes monument, additional fencing, and all involved units whose remits fall within the memorial ground were requested to report any construction projects planned for the area. Leading Phuket government officials, Governor Nisit Jansomwong together with President Paiboon Upattising on February 14 held a press conference at the Phuket Garden Hotel. 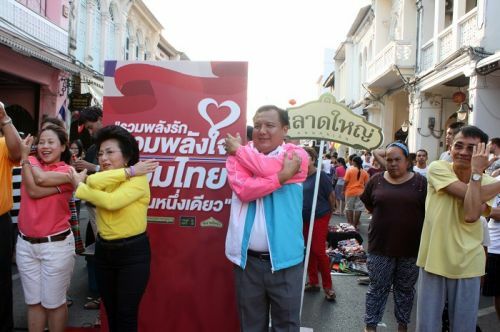 Together, they announced the planned Chinese New Year activities, which will take place on Thursday, February 19, from 5 pm onward, at Sanamchai ground in Phuket Town. Funded by PPAO, the Chinese New Year celebration, which has been organized now for five years continuously, marks the auspicious time as well as unity of all sectors. The year 2015 is represented by the goat, one of the Chinese astrological signs, which symbolizes abundance and prosperity. The primary aim of the celebration, said Mr Paiboon, was to honor the King who is the beloved of all the nation. The event features fun and entertaining activities designed to bring back happiness to the people as well as raising income for local traders and boost tourism. The President reminded the media that Chinese tourists now outnumber any other visitors to the island and as such Phuket must hold world-class activities to receive them and to prepare well for the upcoming AEC. Roughly translated as “celestial glory protects the community,” the celebration will feature many displays reflecting the symbolism of year of the goat and bringing luck to the spectators. Beautifully decorated exhibitions include: the gate of abundance, the road to prosperity, HM the King’s area showing photos of His Majesty’s visit to Phuket, over ten sets of performance by the award-winning China National Acrobatic Troop from Beijing entitled “The Splendid,” local food stalls, craft and souvenir stalls, children area, Chinese language tuition for young people, and Chinese craft making and brush paining, free health check provided by PPAO Hospital. Last but not least, there will be a concert performance by Getsunova featuring popular MC Ying Kanya Raiwin. Governor Nisit added that he was delighted to see that the Phuket community and PPAO still value traditions by celebrating Chinese New Year. Only four provinces in Thailand are known to hold lavish Chinese New Year celebration and Phuket is one of them. This magnificent and world-class event, said the Governor is the first celebration of the year 2015, a gift to everyone from the Phuket authorities and PPAO. 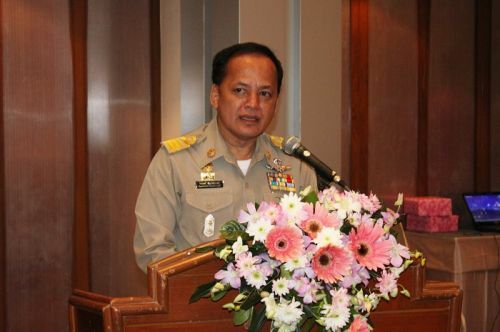 President Paiboon Upattising on February 16 opened a training program to prepare hospitality professionals for ASEAN, at Phuket Merlin Hotel in Phuket Town. PPAO officials present: President Advisor Boonserm Suwannarathphoom, Chief Administrator Watcharin Pathom Wattanapong, Council Deputy Chairman Prasan Prateen Na Thalang, Council Member Somkid Supap and other officials. Attended by 200 participants from local hotel operators, the course is taught by Weerachai Srikajorn, director of Thailand Professional Qualification Institute, Prateep Gulu, deputy of Phuket Manufacturers and Exporters Association, and Darawan Jinda. According to Mr Watcharin, one of PPAO core policy is to develop a lifelong learning program for the community so as to raise their standard of living and career potential. Organized under the larger umbrella program entitled “Learning Activities to prepare for ASEAN,” the course aims to raise the standard and income potential of professionals working in hospitality fields so that they can enter the ASEAN job market with confidence. Some components of the course also educate participants in employees’ rights and welfare benefits. President Paiboon remarked that with an increasing competition, both nationally and internationally, in the field of hospitality and tourism, operators need to prepare themselves well to be ahead of the game. He cited the number of tourism to Phuket, which has increased to 13M per year as opposed to 12M in the previous years. Fifty per cent of tourists, said the President, now prefer to book hotel rooms online. Hotels must prepare themselves to reflect the change in tourism trend. The course, intended for staff from hotels which pays rates to PPAO, would benefit the hotels in the long run and contribute to sustainable tourism, said the President. Mr Paiboon also urged the hotel operators to send staff for treatment at PPAO Hospital, which welcomes patients who subscribed to the national social security insurance. PPAO Hospital, he said, is a quality institution treating at present over 1,000 patients per day. This year, the hospital will add 27 beds to its existing facilities. PPAO is the first national administrative office, which has collected up to 100 M baht in revenue derived from hotel taxes. The organization intends to use the fund to benefit local tourism by organizing training programs in marketing, tourism promotion and raising potential of hospitality staff. “This is a special course intended for those hotels which pay taxes to PPAO. Operators should be proud to have contributed to the society and I believe participants will reap the full benefits from the course,” said the President. 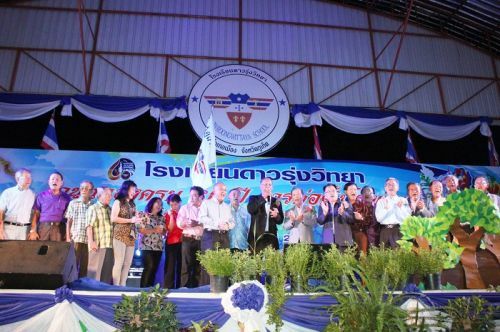 President Paiboon Upattising was among guests of honor at the celebration of Daorung Wittaya School’s 60th anniversary and alumni celebration on the evening of February 14 at Daorung Wittaya School in Phuket Town. Minister Sommai Phasee of the Ministry of Finance presided over the opening ceremony while chairman of the event Kriangsak Suksomboon and the school director Vicar Jeerasak Yongbantom delivered opening and welcoming speeches respectively. Apart from Mr Paiboon, other guests of honor included Vice Governor Panlop Singhasenee. A number of invited guests, alumni, teachers, parents and students attended the event. Daorung Wittaya School was founded 60 years ago in 1954. The event celebrates achievements of the school and its students both past and present. Activities included ceremony to pay respect to teachers past and present, period drama reminiscent of early years of the school, screening of school pictures, entertainment performed by teachers and students. Governor Nisit Jansomwong on February 11 led government officials in paying respect to Phra Kru Metta Pirom (Wirat), abbot of the royal temple Wat Thep Nimit, and to congratulate him on his preferment to the higher Sangkha rank by royal decree on December 5, 2014. PPAO officials present were: President Advisor Boonserm Suwannarathphoom, Council Chairman Theera Jiasakul and Council Member Opas Chopdee. Phra Kru Metta Pirom blessed all the officials present. 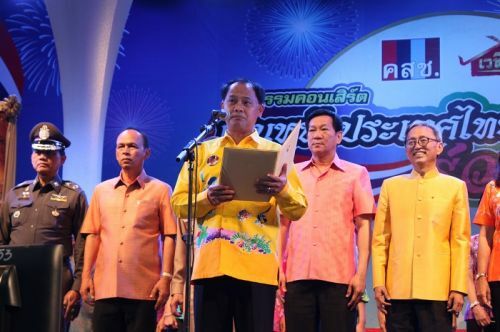 Phuket authorities led by Governor Nisit Jansomwong on February 14 swore allegiance to Their Majesties the King Bhumibol and Queen Sirikit on the occasion of the launch of NCPO-initiated reformation concert taking place at Sapan Hin main stage. President Paiboon Upattising and Council Members Theera Jiasakul took part at the occasion. The event was participated by representatives from government agencies, private sectors, public organizations, and members of the public. Of note was the artists from the cable television channel Vetheethai and its president Kosit Suwinitjit. 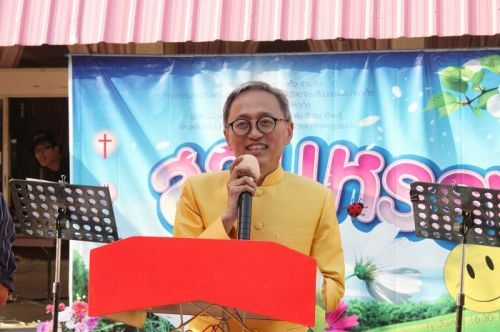 President Paiboon Upattising on February 14 hosted the launch of a religious day event (recreational activities for families and society) at Sala Prachakhom Hall in PPAO offices. The event was attended by PPAO officials, members of the Phuket Christian churches, and invited guests. PPAO officials present: President Advisor Boonserm Suwannarathphoom, Chief of Education, Religion, and Culture Division Ouiporn Sakultan. Recreational fair is collaboration between PPAO and the Phuket Christian Churches Association. Taking place every weekend from February 14 to March 8, the event provides leisure activities for family members to enjoy together. Vicar Thikun Papsaneh, President of the Phuket Christian Churches Association, believes that happy families form a foundation for a quality society. Activities during the fair include: art for young people, vocational skills trainings, health promotion, and music in the garden, among others. The fair is free and the general public is welcome to take part. Vicar Thikun in his speech thanked President Paiboon for his continual support to the local Christian churches. President Paiboon thanked all local Christians who he said turned Sala Prachakhom into a place of loving kindness. He also thanked the Phuket Christian Churches Association for its good work for the society. The President urged all attended to give and receive love freely on this Valentine’s Day. The greatest love of all, he said, is the love Jesus Christ gave to mankind. 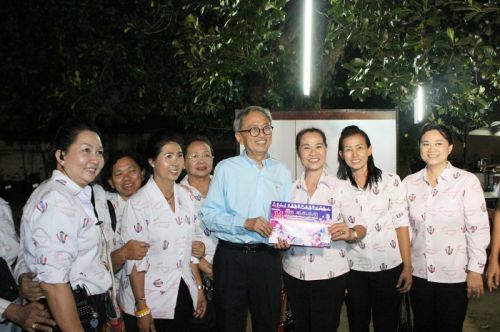 A charity boxing event organized by Phuket Women’s Volunteer Defense Corps was held on the evening of February 14 at Suan Maprao Market in Rawai subdistrict. Deputy Governor Pakpoom Intarasuwan hosted the launch with President Paiboon Upattising as guest of honor. 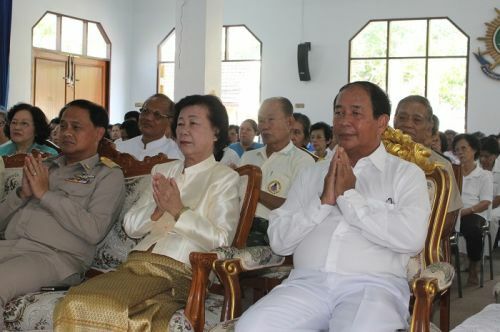 President Paiboon was accompanied by Council Secretary Kraiwut Kumban. According to the chairwoman of the Corps, Porntip Lohkaeo, the charity boxing matches aimed to raise fund for the organization’s expenditures. The event also helped train volunteers in fighting and self-defense skills deemed necessary for defense corps members who work as auxiliary forces for the Territorial Defense Department both during war and peacetime. The matches, said Mrs Porntip, encouraged cooperation among members of the society.